Nowadays, the speech quality on our telephone systems is generally very good, irrespective of distance. However, there are occasions, for instance, in an amateur stage production, or just for fun, when it is desired to reproduce the speech quality of yesteryear. The eroder circuit accepts an acoustic (via an electret micro-phone) or electrical signal. 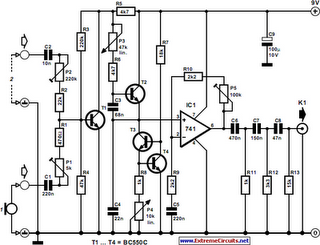 The signals are applied to the circuit inputs via C1 and C2, which block any direct voltage. The input cables should be screened. The signals are brought to (about) the same level by variable potential dividers P1-R1-R4 and P2-R2-R3, and then applied to the base of transistor T1. The level of the combined signals is raised by this preamplifier. The preamplifier is followed by an active low-pass filter consisting of T2–T4, C3, C4, R6–R8, and P4. Although, strictly speaking, P3 serves merely to adjust the volume of the signal, its setting does affect the filter characteristic. Note, by the way, that the filter is a rarely encountered current-driven one in which C3 and C4 are the frequency-determining elements. It has a certain similarity with a Wien bridge. Transistors T3 and T4, and resistors R8 and P4 form a variable current sink. The position of P4 determines the slope of the filter characteristic and the degree of overshoot at the cut-off frequency. The low-pass filter is followed by an integrated amplifier, IC1, whose amplification is matched to the input of the electronic circuits connected to the eroder with P5. The final passive, third-order high-pass filter is designed to remove frequencies above about 300 Hz. The resulting output is of a typical nasal character, just as in telephones of the past.